'...we were invited to a village in Dorset, and went down through teeming rain to the tiny hall where seats were set out in a shallow semi-circle facing a low platform with two chairs, a guitar, several kinds of accordion, a drum and a small lyre. There were readings with music from Vita Sackville-West's poem, The Land. The audience was held enthralled for an hour and a half by this compelling recreation of country life a generation ago. The programme noted the poem's "unsentimental absorption with the unending conflict and collaboration between man and earth - a relationship whose imbalance has become of great concern to 21st-century mankind". We were most delighted that The Land travelled to the 2007 Smithsonian Folklife Festival,Washington D.C in June 2007 as one of the participants representing the best of Kent's culture and heritage for The Roots of Virginia Culture program. 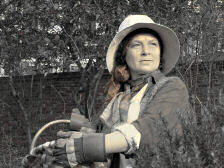 The Land also travelled to venues England-wide in Autumn 2007 and Spring 2008. For a list of venues for 2009 see below. Sonia Ritter and Tim Laycock have created a rare opportunity to hear one of the most remarkable epic poems written in the 20th century in an evening which combines the passion of Vita Sackville-West's poetry with new and traditional music and natural sound. Hailed by both critics and public alike as a masterpiece, The Land was awarded the prestigious Hawthornden Prize in 1926. The power of The Land lies in its singular and vital celebration of rural England and particularly the beloved Weald of Kent where Vita Sackville-West lived. Vita considered the poem to be her true claim to the status of great writer. In The Land , the poet is the narrator and protagonist: an intimate lover of the soil who shares the tough and testing cycle of the farmer's year without sentimentality. She follows the seasons with those who work the soil, revelling and wrestling with the seasonal forces of the natural world and their astonishing beauty. The poem has not lost its poignancy. The unending conflict and collaboration between humankind and the Earth that lies at the heart of the narrative is all too relevant today. Leaping away from the page with all the power of live performance, this adaptation of The Land unlocks the drama of this epic poem and creates an evening that celebrates the joy of the spoken word fused with wonderful music and sound. Saturday 16 May: 7.30pm, Maplethorpe Building, St Hugh's College, Oxford. Collections in aid of Leukaemia Research and the RNIB. 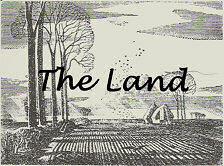 The Land is available for booking. We are currently planning tours in mid 2009 and would be delighted to hear from you if this period is of interest regarding booking The Land. We do welcome other scheduling options too! We can provide all promotional material: leaflets, posters and press release. Tim Laycock is an actor, playwright and folk musician from Dorset with a particular interest in country ways, customs and traditions. He studied English Literature at the University of East Anglia with Angus Wilson and Lorna Sage, and at the same time became immersed in the traditional music of East Anglia and the West Country. He has provided music for many plays including productions at the National Theatre, The Old Vic, and the Chichester Festival Theatre. Tim has written nine plays, most recently an adaptation of The Return of the Native for the New Hardy Players in Dorchester, and A Wonderful Alteration , a community play for Newton Abbot about the Great Western Railway. Tim has an international reputation as the leader of the well-known folk group the New Scorpion Band, and also gives solo performances of traditional folk songs in concerts and festivals all over the country. Read Sonia Ritter's biog in the About Us section. Tim and Sonia first met in the Young National Trust Theatre, and have worked together for 13 years on the spectacular seasonal festivals October Plenty and Twelfth Night with the Lions part . Their mutual interest in poetry, theatre and folk music has led to many fruitful collaborations including The Year Clock , Tim's one-man play about the Dorset poet William Barnes, which Sonia directed.